Known as the “Coca-Cola” route, the Marangu route is a classic climb on Mount Kilimanjaro. It is the oldest, most well established route. Many favor the Marangu route because it is considered to be the easiest path on the mountain, given its gradual slope. It is also the only route which offers sleeping huts in dormitory style accommodations. 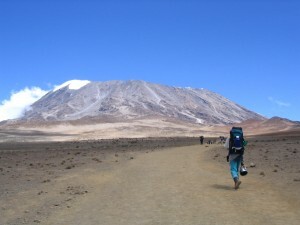 The minimum days required for this route is five, although the probability of successfully reaching the top of Mt kilimanjaro in that period is quite low. Spending an extra acclimatization day on the mountain is highly recommended when climbing Mt Kilimanjaro using the Marangu route. Marangu is favored only during the rainy season, where the hut accommodations are preferred over wet ground, or for those who only have five days to climb kilimanjaro. After having your breakfast we will make a short journey from your hotel in Moshi to National Park gate for the necessary formalities at the gate. We start the climbs through fascinating tropical rain forest; we reach the first hut at Mandara for dinner and overnight. An alternative is to simply rest and relax the beautiful forest around the camp. Marangu Gate to Mandara Hut (2,700 m): 4-5 hours walking. Today the first part of the walk is a steep ascent through forest, but the path soon opens out into moorland and, in clear weather, there are great views of Kibo and Mawenzi peaks. We arrive at Horombo Hut mid-afternoon, where you can relax and enjoy the stunning scenery around the camp. Wake up before midnight in the cover of darkness. We begin a steep climb over loose volcanic scree has some well-graded zig-zags and a slow but steady pace will take us to rim of the main crater, Gillman’s 5,685 m. We will rest there for few minutes to enjoy the sunrise over Mawenzi. We then continue across the snow around the rim for a further 2 hrs for the final push to Uhuru Peak (5895m) – Africa’s highest point. After a few minutes to appreciate your accomplishment we descend to Kiko Hut is amazingly fast, and we stop at Kibo Hut for some refreshment, we continue to descend to reach Horrombo Hut. Today we will descend past Mandara hut to Marangu National Park gate, successful climbers will receive their summit certificates. From here you will be transferred to the hotel in Moshi for dinner and overnight. Transfer by shuttle bus Nairobi- Moshi- Moshi -Nairobi.